(Lowell, MA) A one-person play is like a long blind date – you are stuck with a stranger for the evening, so you inwardly pray beforehand that you’ll like them. But when that one person is actress Charissa Bertels performing her passion project, My 80-Year-Old Boyfriend, you might find yourself cursing time for flying so fast through an entertaining evening. In this autobiographical musical, Bertels plays a struggling version of herself with the perfect amount of self-deprecating charm. She takes us back to a time when she was an actress sprinting from cattle call auditions to a temp job giving away samples of juice. While on the job, she is chatted up by Milton, an octogenarian millionaire who takes a fancy to her because of her red hair. The two strike up a tender friendship that feels just bumpy enough to be realistic; there’s no Tuesdays with Morrie feel with this friendship – the two characters push and poke at each other’s weak spots to grow up and grow closer together. Bertels’ performance is the best asset of this play. She owns the stage from the first moment she hurries onto it, and never lets up with the energy of her performance. She also manages to avoid caricature when shifting from herself to Milton, despite the fact that Milton seems the walking definition of a curmudgeon. 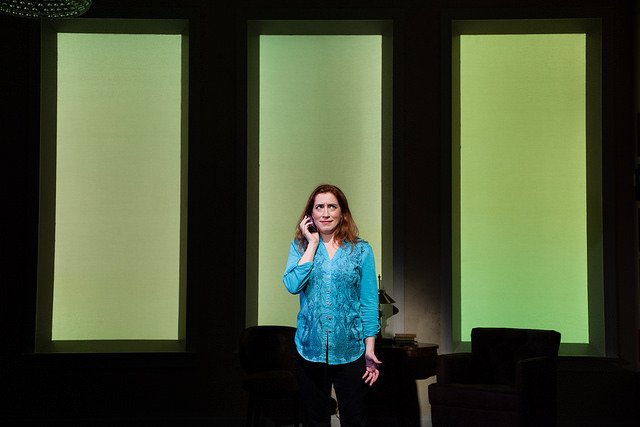 The music fades to the background a bit during this play, and a secondary plot of Charissa’s estrangement from her father feels unfinished, but the action onstage is so enjoyable that any flaws go unnoticed until after the lights go up. Merrimack Repertory Theatre’s artistic director Sean Daniels, who also directs the show, seems to have made a conscious choice to favor new plays for this season. It’s a strategy that can be high-risk and high-reward. My 80-Year-Old Boyfriend is the last play of Daniels’ second season as artistic director, and it also represents the most enjoyable risk he has taken. Here’s to many more undiscovered gems. We elected a thin-skinned bigot to the office of the President dead set on turning our “democracy” into a fascist, totalitarian oligarchy dominated by the 1%. Trump is a monster. His policies, when he names them, are destructive. His narcissistic behavior is more so. This entry was posted in Comedy, Musicals and Opera and tagged 2017, April, Charissa Bertels, Christian Duhamel, Edward Bell, Lowell, MA, May, Meghan Moore, Merrimack Repertory Theatre, My 80-Year-Old Boyfriend, Sean Daniels, Tuesdays with Morrie by craigidlebrook. Bookmark the permalink.